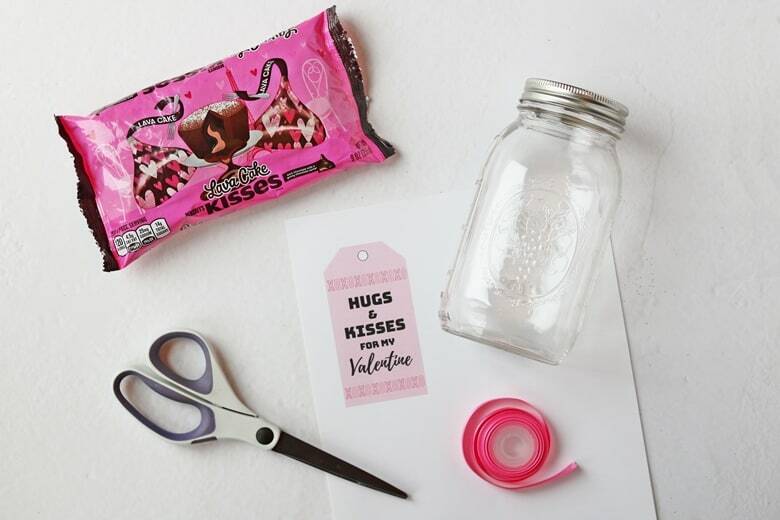 An easy mason jar HERSHEY® KISSES chocolates valentine gift tutorial, complete with a printable “hugs and kisses for my Valentine” gift tag. 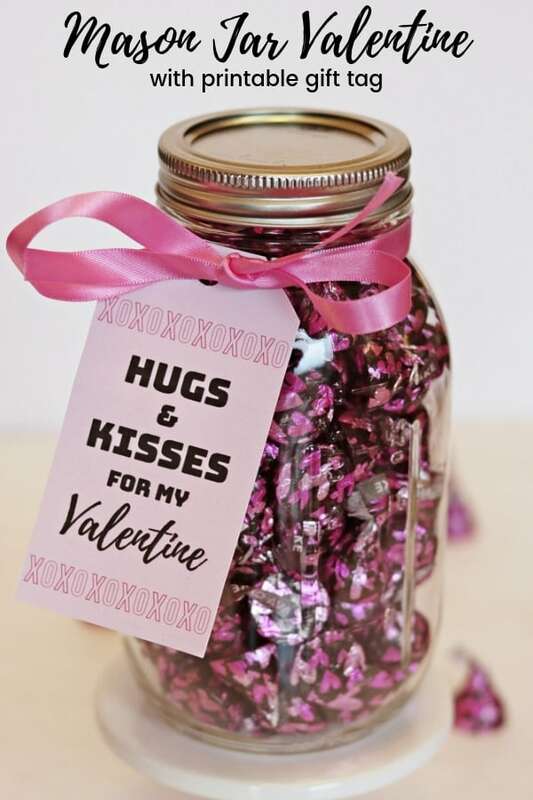 With Valentine's Day just around the corner I have been working on making easy homemade Valentine's Day gifts for friends and family members. Aside from giving my husband and son Valentine's Day gifts, I also like to give other people in our life a little gift on Valentine's Day to let them know that we care about them. 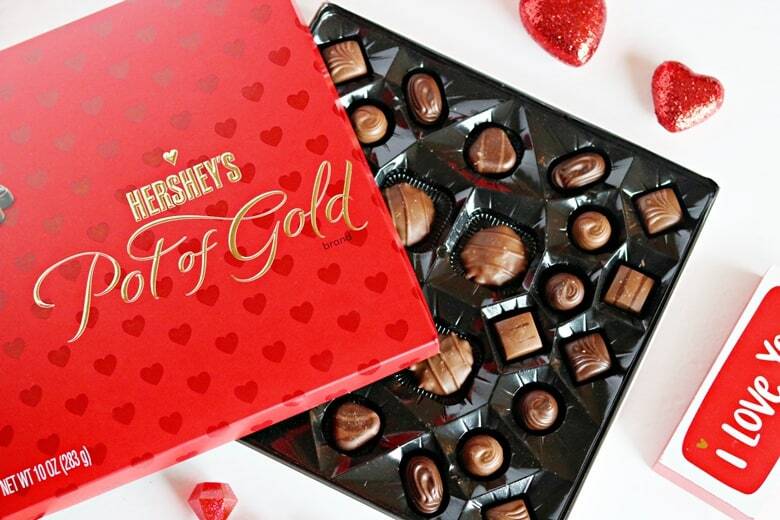 And what better gift to give on Valentine's Day than delicious HERSHEY® KISSES chocolates? HERSHEY® KISSES chocolates and Valentine's Day go hand-in-hand. They really are the perfect little symbol of affection. Made with HERSHEY® rich, creamy chocolate and wrapped in heart-covered foil, NEW HERSHEY® Lava Cake KISSES chocolates are perfect for Valentine's Day gift-giving. 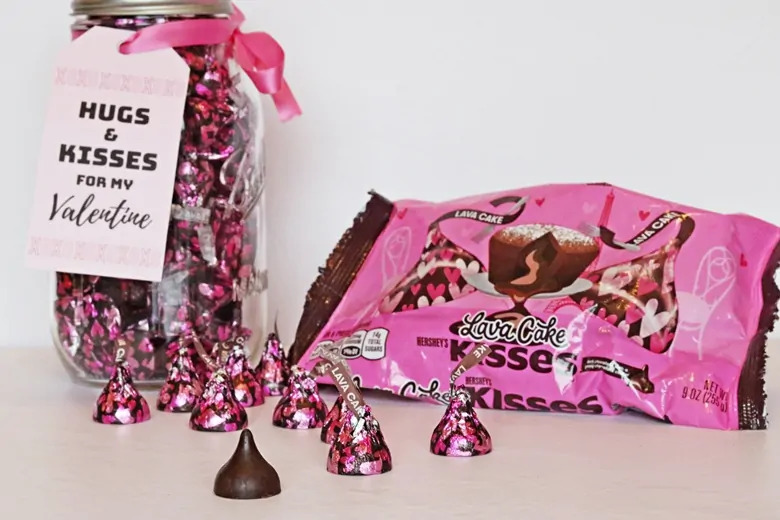 This year, I filled mason jars with HERSHEY® Lava Cake KISSES chocolates, available at Walmart, to make these adorable “Hugs & Kisses” mason jar gifts. I found everything I needed for these gifts and more at Walmart, my one-stop shop for all things Valentine’s Day. When it comes to homemade gifts, it is important to me that they be relatively easy-to-make. That way, I can make a lot of them even when I am short on time. These Hugs & Kisses valentines really couldn't be any easier to make. In fact, these mason jar gifts are so easy to make, you can make them for all your friends, family, co-workers, kid's teachers, and neighbors in just a few minutes. Download and print out “hugs & kisses for my Valentine” gift tag on cardstock. Cut tag out. 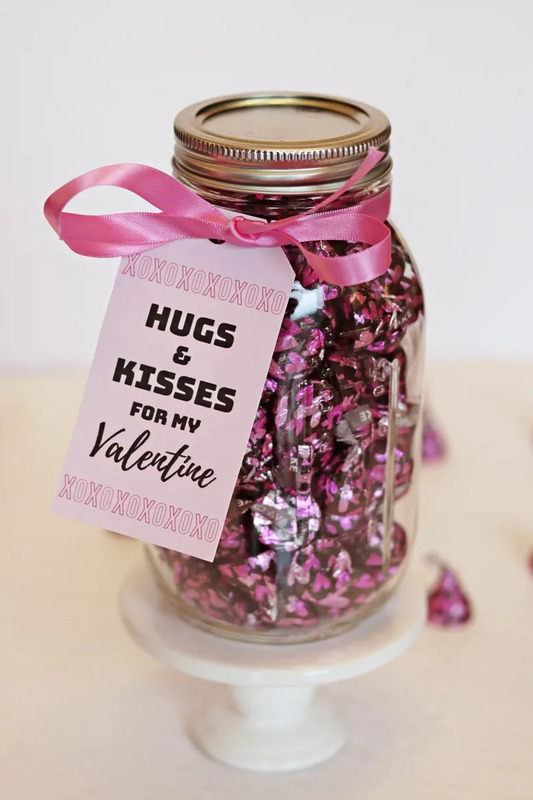 Since my husband is the ultimate chocolate-lover, I am going to give him one of these Hugs & Kisses mason jar Valentine's as well as a box of HERSHEY® POT OF GOLD chocolates. I know that he will love the assortment of milk and dark chocolates and caramel candies that come in HERSHEY® POT OF GOLD chocolates. Visit Walmart for NEW HERSHEY® Lava Cake KISSES chocolates and HERSHEY® POT OF GOLD chocolates this Valentine’s Day! 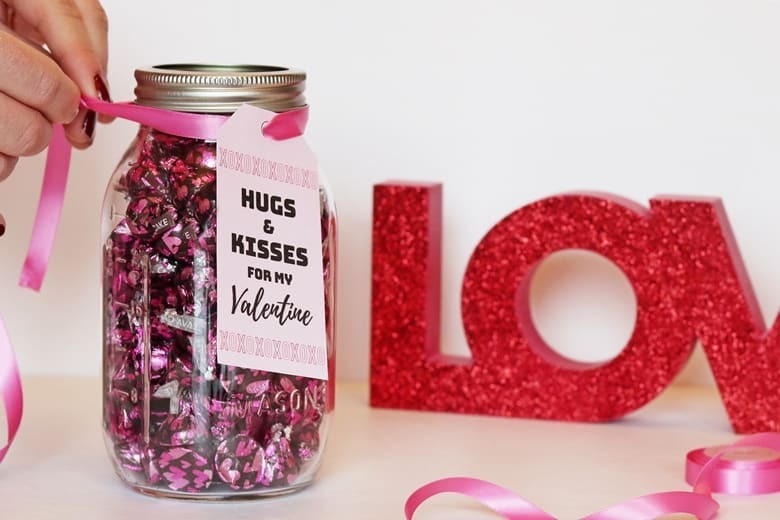 I hope that you enjoy this Valentine's Day DIY gift and have a very Happy Valentine's Day. This is so cute and super simple as well! Love it! I love it , And when your on a budget it’s a great gift for anyone . I love this idea! Such a thoughtful gift!